Cloudera, Inc., the modern platform for machine learning and analytics, optimized for the cloud, announced that Komatsu, a leading global heavy equipment manufacturer, has implemented a cloud-based Industrial Internet of Things (IIoT) analytics platform powered by Cloudera Enterprise and Microsoft Azure. The platform enables Komatsu teams to help mining customers around the world continuously monitor the performance of some of the largest equipment used in surface and underground mining, increase asset utilization and productivity, and deliver essential resources including energy and industrial minerals for the global economy. Komatsu’s JoySmart Solutions is an IIoT-based service that helps customers optimize machine performance using machine data and analytics. The JoySmart platform ingests, stores and processes a wide variety of data collected from mining equipment operating around the globe, often at very remote locations in harsh conditions. Types of equipment monitored includes longwall mining systems, electric rope shovels, continuous miners and wheel loaders. Their data includes time-series metrics — machine pressures, temperatures, currents, etc. — alarm and event data, and other information from third party systems. A single machine can have hundreds to multiple thousand data metrics and generate 30,000-50,000 unique time-stamped records per minute. “By deploying Cloudera Enterprise on Microsoft Azure, our teams make the invisible visible, gaining valuable insights to help customers optimize productivity and mining efficiencies. Cloudera delivered the fast performance, data security and customer support that allowed our teams to access machine data analytics and collaborate with different user groups across the world,” said Reid. Komatsu data scientists can now build and deploy machine learning models faster to understand equipment operation, provide better insights for customers and ultimately influence future mining equipment design. 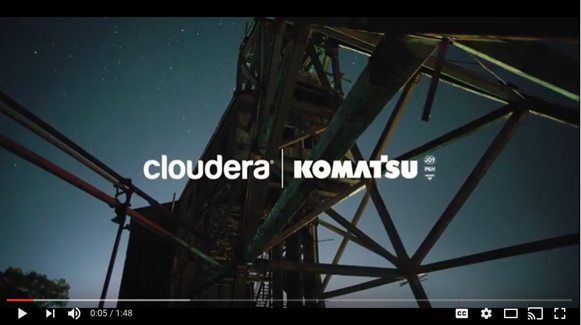 Utilizing components such as Apache Kudu and Apache Spark, Komatsu can drive real-time processing, machine learning, and analytics on all of their IoT data, including data in motion and data at rest.